So, you finally went to Best Buy or Amazon.com and treated yourself to that super skinny flat screen and Blu-ray player. Like a kid on Christmas morning, you tore it out of the box, turned it on, put in a Blu-ray disc and marveled at the stunning 1080p video. Almost immediately, you began to wonder why it sounded worse than the stereo you had in college. After an hour or two on Google, you figured out that you needed at least a decent sound bar, but more likely a sound bar and a sub, or better still, a whole surround sound system. Knowing little about AV receivers; pairing them with speakers; and having no desire to learn all this stuff, the Home Theater in a Box (HTIB) seems like an easy way out. Then you start to think about where you’re going to put that gargantuan receiver; how thick the user guide is going to be, how you’re going to get speaker wires from the receiver to the back of the room without construction or duct tape. You start to feel that there has to be a better way. Well the folks at the WiSA Association think there is, and having heard a concept product, I agree. I remember buying my first “high end” TV. It was before HD, but I lived in Europe at the time and we had 100 fps (vs. standard 50 fps) and it had surround sound. The set, made by Philips, came with two rear speakers. I hastily ran wires across the living room and sat down to enjoy the marvel that was surround sound. After tripping over the wires several times, I finally ran them under the rug, and then I just got really annoyed by the ridges in the rug. Ripping up floorboards to run the speaker wires to the back of the room was too much trouble/expense. So I lived with the ridges in the rug. The novelty of the surround effects wore off and I became increasingly disappointed with the sound fidelity. I knew I could do better, so I tried to find out what other speakers were compatible with the TV. Of course there was no other info on the “amp” inside the TV, or anything that would help me choose better speakers. I lived with it for a year and then I bought my first real surround sound system: a receiver with Dolby ProLogic and real 5.1 speakers. Of course that meant more wires! I moved house a short time later and rewired a great deal of the house that I bought, so I wired for AV at the same time. Last year my wife and I moved into a new (99-year old) house. We gutted the entire first floor, stairs and second floor hallway and I ended up rewiring the entire house, as it turned out that we were the proud owners of a great deal of genuine, vintage, knob and tube wiring. I naturally took the opportunity to run network and AV cables to everywhere I thought I was going to need it. With a plan to remodel the basement, which included a dedicated Home Theater, I wired the living room for my existing 7.1 sound. I figured I’d upgrade my receiver and wire for at least 11.4 when I built the dedicated theater. Alas, a few months ago, my Onkyo receiver died. I replaced it with a Denon 4311CI, which has support for 11.2 sound. With at least another year before we begin the basement remodel, how could I live with 7.1, while being taunted on a daily basis by 11.2 capabilities? I couldn’t. Even though I have relatively easy access via the basement, it was a pain (and way too time consuming) to add the front wide speakers (highly recommended by the way). Wireless would have been so much easier. As much as a pain as it was, I was one of the lucky ones, being a home owner with and unfinished basement. Anyone living in rented accommodation really has no choice: live with wires running across floors or under rugs, or get wireless. Another possibility for the construction-averse is sound bars. These have come a long way in the last few years. Many now incorporate “virtual surround sound” but such schemes tend to have a very limited sweet spot, a narrow soundstage and are no match for a true surround system. There are several vendors who offer either wired or wireless subwoofers that help with the bass, but these typically do not provide the same bass management as a true surround system. Although sound bars are becoming increasingly popular, they are either typically installed in secondary locations, such as kitchens and bedrooms, or they are purchased because anything else is just too much work or expense to install. Wireless allows the freedom to choose based on needs/wants rather than practicalities. Total interoperability. Except in the most extreme cases, speaker wire is 100% compatible with all receivers and speakers. Excellent quality. Unless really cheap cable is purchased, speaker wire has outstanding performance if kept away from interference sources, correctly sized for power and distance and properly terminated. Low cost. There are those that consider high priced speaker wire as akin to snake oil and others that swear by it, but the fact of the matter is, excellent quality can be achieved for under $1/foot. Before we delve into wireless, let’s be clear that we’re talking about wireless audio, so power is still required. While there are truly wireless speakers on the market, these require batteries and are typically for ad-hoc use on the deck or by the pool, for example. Many use the overcrowded digital audio frequencies used by WiFi, Bluetooth, baby monitors, cordless phones and microwave ovens, which results pops, clicks, hisses, etc. Lack of interoperability, which means I have to buy from one vendor’s limited selection. Poor fidelity. Many offer less than, or just about, CD quality. Low power. Many are limited to 25W per channel. A few max out at 50w. Some require line of sight (infra-red). The WiSA Association, established in 2011, aims to simplify things and improve fidelity at the same time. The WiSA charter is to “foster a new quality and interoperability standard for the wireless transmission of HD audio in a home entertainment environment.” In other words, develop audiophile wireless audio standards that are compatible with a wide range of vendors’ products. The WiSA Association has some lofty, but necessary, goals. Quality should not suffer just because wires are not used. Many wireless speaker systems reduce sampling rates or compress data to work within the limited bandwidth available. Both of these strategies are normally discernible in the reproduced sound. Nobody wants poor fidelity and latency is critical in a surround sound system. It can manifest itself as lip sync problems or a poor surround experience if it is variable. A well designed wireless speaker can actually offer increased fidelity in comparison to a wired speaker, because it can contain an internal amplifier that is precisely tuned to the speaker. Typically, speakers are driven by an external amplifier that knows nothing about the properties of the speaker. The speaker usually contains a passive crossover circuit and it is the adjustment of this circuit that determines the “voice” of the speaker. When working with passive components, crossover designs have to be changed for the same driver in different enclosures. The chipsets that are available for building WiSA-compliant receivers include a digital signal processor (DSP) which a designer can adjust in the lab to match built-in amplifier and speaker characteristics. The net result is that better sound can be produced with lower quality components, or better yet, can make high quality components sound even better. Using multiple built-in amplifiers (one per driver) and the receiver chip’s DSP acting as an active crossover reduces the amplification and equalization cost and is easier to tune precisely in comparison to passive crossovers. Having audiophile quality is useless if it can’t be delivered without interruption. WiSA devices achieve this with both their choice of frequency band and channel selection algorithms. WiSA devices operate in the recently released Unlicensed National Information Infrastructure (U-NII) 5 GHz band that requires Dynamic Frequency Selection (DFS) procedures. This frequency range, which has 24 channels, was reserved for weather and military radio bands in the past. This is now available as long as the system is capable of detecting conflicts and avoiding them. It transpires that these frequencies are rarely used because of the stringent DFS requirements. DFS channels 52-140 are virtually unused and therefore leave plenty of space for wireless audio. This allows the transmitters to use the available frequencies to their fullest and avoids virtually all reliability problems associated with wireless communications. 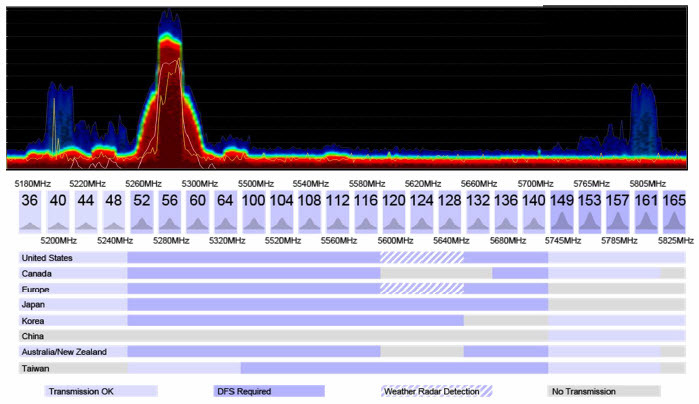 Further, no performance degradation in local Wi-Fi traffic due to interference will occur. To further reduce the risk of interference, the WiSA transmitter does its best at startup by looking for a completely unoccupied channel and then even looks ahead for an additional unoccupied channel so that, in case of interference, it can jump to this second channel without losing a single bit of audio information. Error concealment – missing (uncorrected) data is filled in a way that is unnoticeable. As part of compliance testing, WiSA-compliant components are tested to ensure clean communications within a 30×30 foot (9x9m) area even when interference is present. One of the attractions of HTIB systems for many is relatively easy installation and setup. Wires are typically color coded, so it’s hard to go wrong. For those going for the separates approach, most mid to high-end AV receivers ship with a setup microphone. This is positioned in either one or several listening positions and a series of sounds are emitted from each speaker to determine distance and room acoustics. I’ve done this many times and it’s a time consuming and cumbersome process. WiSA requirements simplify this: the user just positions the speakers, plugs them in and lets the system do everything. On a higher end setup this can be totally automated. On less expensive systems, the user may have to designate speakers to specific audio channels (front, left, right, etc.). This process can be accomplished with an on-screen display or mobile app. If the speakers are repositioned the process is quickly repeated. Many people start off with a limited system and scale up, which is impossible with a HTIB. I know I did. I went from 5.1 to 7.1, now at 9.1 and shortly moving to 9.2. 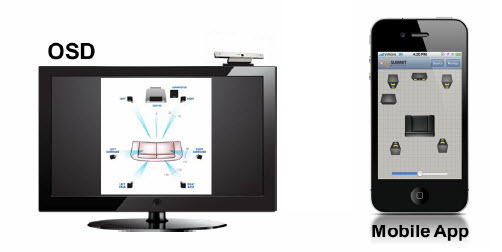 A consumer will, for example, be able to buy a TV, DVR or Blu-ray player with a WiSA logo signifying it is equipped with a transmitter and pair it with a sound bar or 2.1 speaker set that also has a WiSA logo. At some point in the future, additional speakers can be added, up to a current maximum of 7.4. Conversely, I may blow 90% of my AV budget on that must have OLED display and spend just $1,000 on a set of 5.1 speakers for now. As I pay off my credit card, I can upgrade the speakers to something better matched to my $10,000 TV. Another example is the release of further higher channel-count content. Today, most titles are mixed in 5.1. More content will be released in 7.1 in the future and all the major audio companies (Dolby, Lucas, SRS, etc.) are now moving towards channel independent algorithms and object oriented sound. As these come to fruition, adding more channels may be desirable. Conformance is critical to market acceptance and the success of WiSA equipment. It’s attractive to manufacturers too, on several fronts. Why spend millions of dollars on wireless research when there are ready made, proven chipsets available? Further, selling AV equipment is much easier if it’s interoperable with a wide range of products on the market. In order to guarantee conformance and certify products, the WiSA Association produces a Compliance Test Specification (CTS). Compliance testing will be carried out by Simplay Labs, LLC (who carries out HDMI compliance testing), and all products sporting the WiSA logo will have to pass the CTS. Part of the testing process includes testing for compatibility with existing products on the market. The WiSA approach is great for those who feel that HTIB or a sound bar is the only practical solution for their needs, but it’s designed for the audiophile too. It finally allows the audiophile to unshackle their speakers and the home theater enthusiast to build something today and expand tomorrow without running lots of extra cable or conduit during construction or ripping apart walls after the fact to add more channels. As long as power is available, as many channels as WiSA equipment supports can be added at will. Today WiSA-certified systems support a maximum of 8 channels (e.g. 7.1), but support for more channels and higher bit rates are planned. Several vendors have products in development and are expected to ship in the first half of 2013. At CEDIA 2012, I had the opportunity to listen to a 5.1 concept design from Klipsch. All I can say is that it was impressive. Aperion, an advisory board member, is currently shipping their Intimus 4T Summit Wireless 5.1 and 7.1 systems which incorporate this technology, but are not currently certified by the WiSA Association. Under the WiSA logo, we will finally have certified, high fidelity, interoperable, robust and scalable solutions for wireless audio. Consumers will be able to choose speaker setup based on their needs or desires instead of technical knowledge or practicalities of wiring. Those just dipping their toes into multi-channel audio can start offsmall and easily add channels. Conversely, they can start off with a budget system and upgrade as needed. Finally, in the race for the skinniest TV, manufacturers can practically dispense with internal speakers and offer consumers a choice of speakers based on needs and budget.